Modern electric system is facing challenges such as climatic changes, power shortages, blackouts, global warming and energy imports to meet the global energy demands. To address these challenges, advance energy storage technology is used for storing surplus amount of electricity which can be utilized during critical situations. Growing electricity demand is propelling the adoption of energy storage systems by energy and utilities sector. Government is now more focused on energy storage technology and the global investment for storage energy technology was USD 10 billion in 2016 where 40% of the total invested was shared by the US. For instance, in 2015, the U.S. government invested for 95 energy storage projects with installed energy capacity over 357 MW. In 2014, China installed 31 MW of energy storage whereas Europe Union installed 27.7 MW of energy storage respectively. Wide acceptance energy storage system and increasing number of energy storage projects are driving the growth of energy storage systems market. Goldstein Research analyst forecast the energy storage systems market size over USD 296 billion by 2024 from USD 170 billion in 2016 and is projected to grow at a CAGR of 7.2% during the period 2016-2024. The report covers the present ground scenario and the future growth prospects of the energy storage systems market for 2016-2024 along with the wide range of technological application for different energy types in every region. We calculated the market size and revenue share on the basis of revenue generated from price trends and energy consumption quantity and installed capacity of storage systems across the globe. In terms of technology, the market can be segmented into mechanical, electrochemical, thermal and chemical energy storage system. Mechanical & electrochemical energy storage systems are generating and distributing maximum power energy across the globe, where mechanical energy storage system occupies 24% share of global energy storage systems market in 2016. Energy Storage Systems Market Outlook 2016-2024, has been prepared based on an in-depth market analysis from industry experts. The report covers the competitive landscape and current position of major players in the global energy storage systems market. The report also includes porter’s five force model, SWOT analysis, company profiling, business strategies of market players and their business models. Global energy storage systems market report also recognizes value chain analysis to understand the cost differentiation to provide competitive advantage to the existing and new entry players. 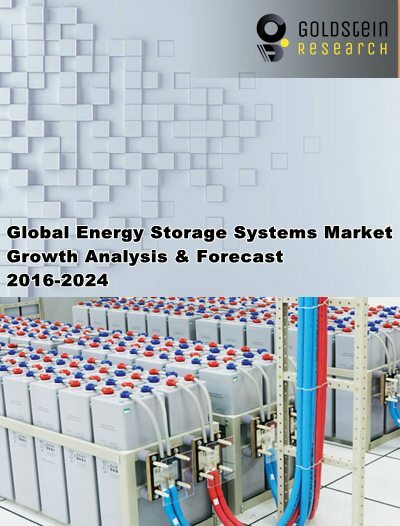 Our global energy storage systems market report comprises of the following companies as the key players in the energy storage systems market: ABB Ltd., LG Chem, Ltd., Tesla, Inc., Samsung SDI Co, Ltd, AES Energy Storage, EnSync Energy, General Electric and Panasonic. Other high-flying vendors in the market are: Mitsubishi Heavy Industries, Enersys, Active Power, Beacon Power, Greensmith Energy Management Systems, Convergent Energy and Power Inc., Sonnen, Redflow, Eos Energy Storage, Alevo, Seeo Inc., BYD Company Ltd., Scheider Electric, SMA Solar Technology AG, SK Holdings, Enerbrax Acumuladores Ltda, Eguana Technologies, Autobat SACI, Imergy Power Systems., Ionotec Ltd and Exide Industries Ltd. According to the report, major driver in energy storage systems market is growing spending on renewable energy. Conversion and storage of different forms of energy is a major challenge, thus bulk amount of energy is mainly stored by hydroelectric dams, rechargeable batteries and solar photovoltaic. Aim to achieve low carbon economy by many countries are fueling the investment in renewable energy storage system thereby generating enormous scopes for energy storage systems market. For instance, in 2017, the UK government invested USD 320 million for battery technology in order to achieve low carbon economy with energy storage. These investments are likely to accelerate the energy storage system market growth during the forecast period. Further, the report states that one challenge in energy storage systems market is cost competitive energy storage technology. Installation of energy storage systems with high installed capacity is an expensive venture as compared to the conventional process. Countries such as India has huge potential for energy storage system market however due to poor financial condition and proper infrastructure is preventing the wide scale deployment of energy storage projects within the country. Moreover, lack of legal framework or regulation mainly in developing and under developed countries is hindering the energy storage system market growth. Based on geography, Asia-Pacific is the dominating region for energy storage market and is projected to grow at a CAGR of 10% during the forecast period. Middle East & Africa region is projected to grow rapidly at a CAGR of 9.0% during the analysis period. Huge demand for electricity and rising number of power generation projects in countries such as Brazil and Mexico are expected to create pool of opportunities for energy storage system in Latin America region. What is the total market size by 2024 and what would be the expected growth rate of installed capacity? What are the installed capacities in 2015-16 (MW) and what would be the expected demand over the forecast period?